I've lamented the state of reading management software a bit on Twitter. I use: - Goodreads to track reading - LibraryThing for inventory - Amazon for wishlists - Calibre for ebooks All of these are terrible. There's a lot more I could say about each of these (and their alternatives) but what want to talk about today is the issue of tracking books that you are planning to read. I had been doing this just in my head up until recently, when I started using a text file. (Yes, there's the to-read shelf on Goodreads, but it is far too simplistic for my purposes.) Here's an excerpt. Most of the work I have done so far has been to assemble a list of all the books I want to eventually read. I'm about half-way done putting it together: at the bottom there's a list of authors I want to read but I have not assembled a list of their books. I am organizing the list by author because that is how I generally think about reading. I would rather follow one author I really like across different genres of fiction or different non-fiction topics rather than picking a random author in a genre or topic I am interested in. Of course I will continually adjust the list as I proceed. I will add new authors or books as I discover them and perhaps remove some if I decide I don't want to read them after all. Some books are already marked with a question mark to indicate that I am not sure how much interest I actually have. The length of the list (there are 233 TODOs presently) is concerning. As I child I loved reading and was constantly looking for new reading material. I wanted my books to last longer, and I tended to re-read my favorites. Now that I have such a daunting backlog I have tended to think more in terms of how quickly I can plow through it. I don't have a good way to measure how frequently new books get added to my internal list (perhaps by writing the list down I will get a better idea) but I feel like recently the list has been growing faster than I have been working through it. Part of the value of making such a list is to consider all of one's options and make conscious decisions to prioritize. Although I show two living authors in my screenshot above, overall they are far outnumbered by the dead. If given the choice to read living or dead authors for the rest of my life, I would pick the dead without having to think about it. I feel like I might do a better job of reading deeply if I had a shorter list. I tend to start a new book the same day that I finish one. I suppose I could enforce a "cool down" period to reflect on a book, or force myself to write down my thoughts about it before I pick up the next one. I have much less time to read now that I am married with children, so my ideas about how many books I should be reading in a year probably needs to be recalibrated (it has been hanging around 30 the last 2 years). One positive thing is that I have implemented reading queues. I was always the sort to read multiple books at once. At one point I had a very bad habit of reading the first 100 pages or so and then getting bored and starting something else. For a while I had over a dozen books I was ostensibly working on. As I forced myself to be more disciplined about finishing things, I settled into a habit of reading several books in different categories. The first I am calling Primary for lack of a better word. It is usually fiction, although I would put history, poetry, and biography into this category as well. It's basically whatever I am reading that doesn't fall into one of the other categories. I aspire to read a number of major theological works, so I have a separate queue for that. I have set a pace for myself of a certain number of pages per week. This has to be done in parallel with my other reading or I would never get to it. I also tend to pick up short books from time to time and read them over a couple of days. Most of these could be read in a single sitting if I didn't have babies. I don't really need to plan this since it is a spontaneous thing and doesn't disrupt my other reading habits, but I put it in my list for completeness. One major disfunction of my current habits is that I have not done much rereading. I read the Bible on a yearly schedule, but other than that I have not revisited the my most important formative books in a number of years (Lewis, Chesterton, Tolkien, MacDonald, etc). I would like to figure out a way to work rereading into my system, but I'm not sure how to do it yet. I have considered setting aside a year to just read books I have already read. At certain points I have kidded myself that once I get through the bulk of the new books I want to read I will get back to the old ones, but I think it is clear that at the current rate I will not get there for many years, if ever. I suppose the obvious thing would be to add a queue for rereading, but that doesn't really fit with my contextual scheme, and I don't want to set a page quota for rereading the way I have for theology. Another option would be to work rereading into my existing queues on some schedule, so perhaps for every two new books I complete, I would have to read an old book. I think there will actually be two tiers of rereading. One would be books that I want to read at least a second time because I have a feeling that they are important and that I did not fully understand them the first time through. The other set would be books that I consider so fundamental to my identity that I want to read them over and over again in rotation. I am planning to put these lists together in my text file eventually. I still have a lot of work to do on the eventual reading list. Some authors I enjoy so much that I want to read everything they have written, or at least their major works. Others I only am interested in a particular series that appeals to me. Then there are some that I am interested in, but I may only read one book by them, just to get an idea of their thought and style. For the authors I have never read, I don't know yet what category they will fall into, so what I have now is necessarily provisional. There are also whole areas of literature that I am not familiar enough with to know what I should read. For instance, I want to become familiar with the the church fathers, but I don't know enough yet to know which authors I want to read or which works. 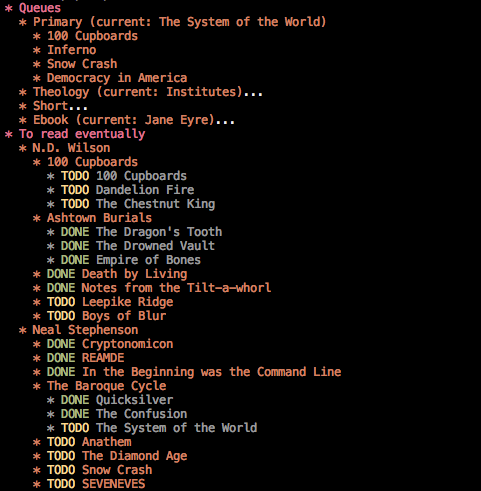 I have bookmarked a couple of reading lists, but I haven't figured out exactly what I want to do yet. While it is a lot of work to make these decisions and build a definitive list, I think it is worthwhile because it is helping me to make progress toward my long-term reading goals rather than just reading whatever strikes my fancy in a given moment. I still allow myself a lot of freedom to pick what to read next, but by taking time to weigh which books I really want to read, I think I will make better choices overall.